I have a Grey Wolf 2013 26R. I recently took ownership of the TT in divorce settlement and moved to New Mexico. It had been winterized the previous fall and had not been readied for camping in the spring due to the divorce. I read how to de-winterize, watched YouTube videos, drained the pink fluid from everything. I finally was able to get the water heater lit. However, I was told at some point in the past about the valves under the bed with the red and blue lines. No one told me what to do about them. One guy tried to help but I don't think he opened the valves correctly. The water is hot in the pipe, but I don't think the tank is filling because I get about 20-30 seconds of hot and it's gone, not six gallons worth. Should all three valves be open for the tank to fill and heat? This is a common, nearly universal, valve arrangement. They may have the crossover valve open. We keep this thread (link below) as a sticky at the top of the plumbing section...which explains several of the winterization valve arrangements. Also, be aware that while the set up shown in post 2 is probably the most popular, there are a number of ways they have come up with to plumb these water heaters. See page 2 of the generic plumbing pic I've attached. 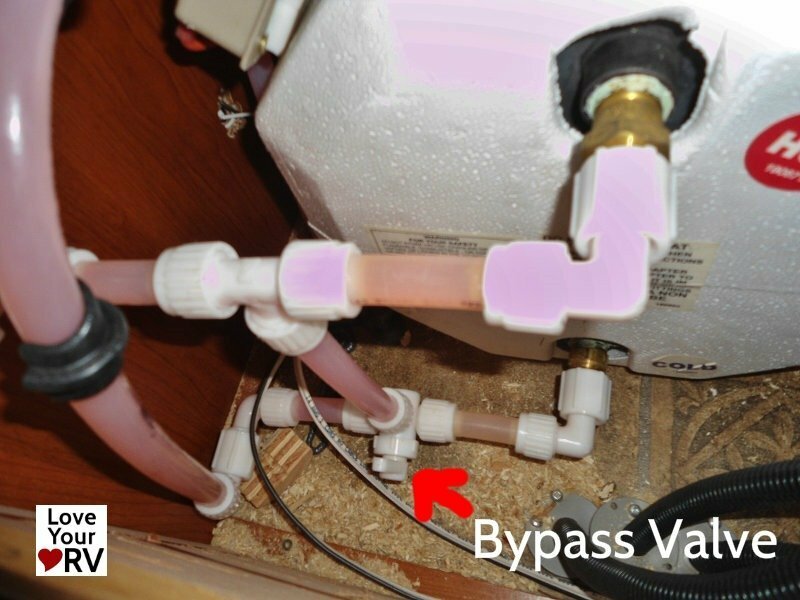 However you're plumbed, you don't want water flowing through the bypass. And when it's time to winterize, you turn each valve you have to the opposite position. Note the brass colored check valve on the hot water outlet at the top of the tank and the single diverter valve on the cold water inlet. Also note the check valve is critical but easy to replace if it fails. Mine is ending it's 14th season without difficulty. Side note: my PEX pipe looks like the photo. No red and blue piping in the trailer just a thin red or blue tracer on the translucent pipe. Later piping seems to be color coded entirely. You have option #4 in my diagram. I have to brag on FR rv's. We've had other brands and they did what was normal to us. Set hot all the way open and cold just on, get wet, close shower head off, etc. With the Rockwood we have, 4 people can take a shower back to back and leave water running. We do have the gas and electric on.